Pack Like a Pro! Our Top Recommendations for Your Next Zoëtry Escape! It’s Friday and we only have one thing on our mind: getting ready for our next weekend getaway! Packing can sometimes be a stressful occasion but we’re here to share our top must-haves for your suitcase to ensure your next escape is the best yet. At Zoëtry Wellness & Spa Resorts, immerse yourself in The Art of Life®. Unrivaled luxury and holistic wellness combine with Endless Privileges® to offer a blissful experience that exceeds all expectations. Each resort features no check-in or check-out times; 24-hour private, in-suite dining; maid service three times daily; a welcome bottle of rum or tequila; and so much more! 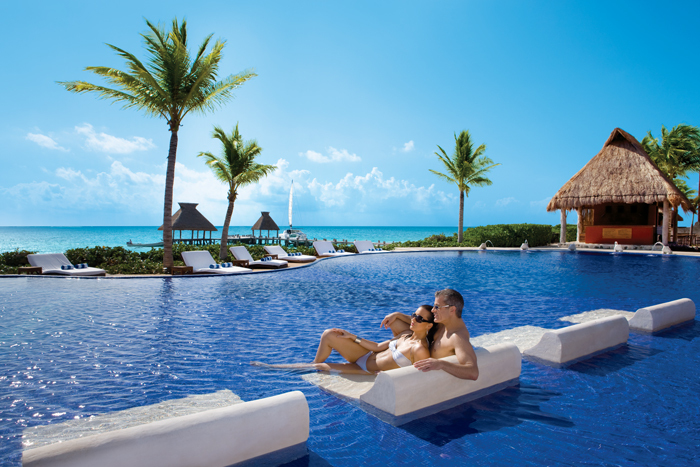 A couple relaxing by the pool at a Zoëtry Wellness & Spa Resort. 1. Poolside fun: Whether lounging by one of our gorgeous pools or beachside, be sure to bring a few items to enjoy during your relaxation time! We recommend a great book or e-reader device (bonus points for readers with an anti-glare screen!) or a music streaming app on your smart phone to enjoy some of your favorite tunes while catching a few rays. 2. Fashion for day and night: Although many of our gourmet dining options welcome casual, resort attire during the day, some restaurants do call for more formal attire at night. Be sure to pack your favorite swimsuit and cover-up for daytime fun and long pants and collared shirts for men and blouses, skirts, slacks or dresses for women. 3. A great beach bag: In an effort to keep your suitcase light and free of too many items, select a larger, functional bag that can serve as a beach bag to bring your favorite items with you to the beach or pool by day and a stylish option to bring to dinner or drinks at night. 4. A water-proof camera: Although smart phones also serve as great cameras, no one wants to worry about their phone being ruined by water while snapping pictures by the beach or in the pool! Many drug stores offer inexpensive, disposible water-proof cameras for capturing your memories without the fear of water damage! 5. Take out those toiletries! All Zoëtry Wellness & Spa Resorts proudly provide guests elegant Bvlgari® bath amenities, hair dryer and a vanity mirror en suite. That’s less room in your suitcase for lotions and shampoo and more room for beautiful souvenirs. Is your bag already packed and ready to go? Act fast! Now through April 30, the longer you stay the more you save with our Unlimited Air Credit special offer. Get $50 air credit per room, per night when you reserve your stay at any Zoëtry Wellness & Spa Resort by April 30, 2015 for travel from February 25, 2015 to August 21, 2015. Plus, receive up to $400 in resort coupons! This entry was posted in Zoëtry Wellness & Spa Resorts and tagged beach, pool, special offers, unlimited air credit, Vacation. Bookmark the permalink. ← Want More Zoëtry? Check Out Our YouTube Channel!